WHAT CONNECTS AARANYA KAANDAM AND K BALACHANDER? Thiagarajan Kumararaja’s Aaranya Kaandam is one of the important films in Tamil cinema. Its heroine Yasmin Ponnappa, after a long hiatus, will be seen in an upcoming independent and experimental film called Kalki along with Kishore. The film's title remains unique not just in name but also in its meaning, destroyer of filth. The movie poster has interesting visual of Kishore trying to portrait a workaholic while Yasmin is spotted with an enchanting smile. This thriller has been directed by debutant Dhilip, the screenplay and the dialogues are penned by Baradwaj Rangan, the cinematography is handled by Vijay Karthick Kaanan while editing and music are handled by Sreekar Prasad and Girish respectively. Producer Shruthi of Pramod Film says, "The film will reflect the class we are determined to present. We are very confident of holding our flag high when it comes to the matter of competition in the international film festivals with Kalki. Rembon's extraordinary art and design deserve a special mention. All thanks to the amazing crew who toiled together day and night for the film." 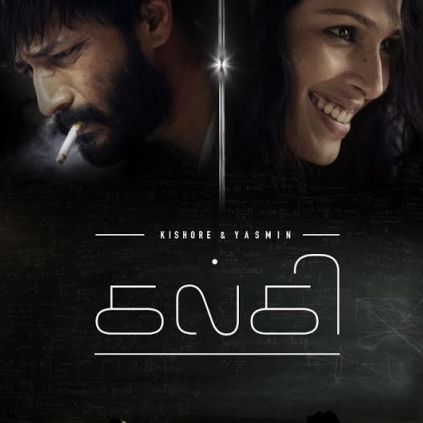 It has to be recalled that director K Balachander directed a film called Kalki which had Shruti, Prakash Raj, Rahman, Geetha and others that released in 1996. Actress asked to vacate her house for being single! Popular TV actress to file divorce! Baahubali 2 overtakes this film and secures the first place in Chennai! Guess what? Anushka Shetty got rejected after this photoshoot! Raghava Lawrence reveals the exact reason on why he opened a temple for his mother! Editor Kishore’s Father Passes Away! Kishore Continues To Raise The Sickle..
People looking for online information on Kalki, Kishore, Yasmin Ponappa will find this news story useful.